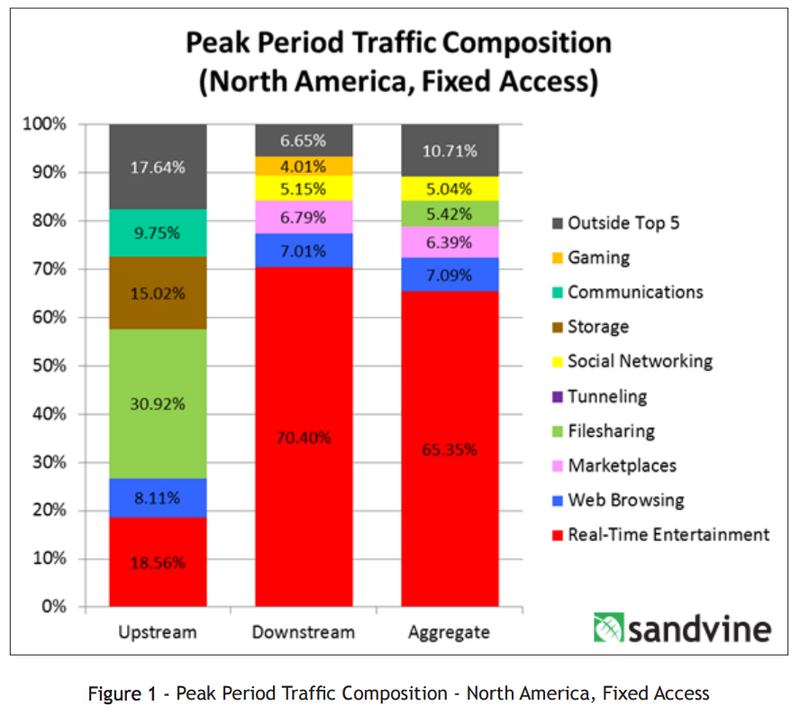 Sandvine's Global Internet Phenomena Report (December 2015 edition) reveals that real-time entertainment (i.e., streaming video and audio) traffic now accounts for more than 70% of North American downstream traffic in the peak evening hours on fixed access networks (see Figure 1). Interestingly, five years ago it accounted only for less than 35%. Netflix is mainly responsible for this with a share of >37% (i.e., more than the total five years ago) but already had a big share in 2011 (~32%) and didn't "improve" that much. Second biggest share is coming from YouTube with roughly 18%. I'm using these figures within my slides to motivate that streaming video and audio is a huge market - opening a lot of opportunities for research and innovation - and it's interesting to see how the Internet is being used. 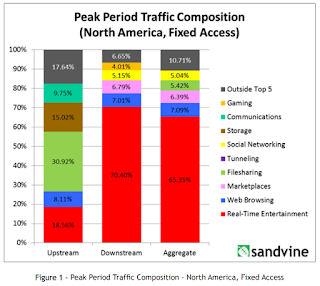 In most of these cases, the Internet is used as is, without any bandwidth guarantees and clients adapt themselves to what's available in terms of bandwidth. Service providers offer the content in multiple versions (e.g., different bitrates, resolution, etc.) and each version is segmented to which clients can adapt both at the beginning and also during the session. This principle is known as over-the-top adaptive video streaming and a standardized representation format is available known as Dynamic Adaptive Streaming over HTTP (DASH) under ISO/IEC 23009. Note that the adaptation logic is not part of the standard and open a punch of possibilities in terms of research and engineering. Both Netflix and YouTube adopted the DASH format which is now natively supported by modern Web browsers thanks to the HTML5 Media Source Extensions (MSE) and even digital rights management is possible due to Encrypted Media Extensions (EME). All one needs is a client implementation that is compliant to the standard - the easy part; the standard is freely available - and adapts to the dynamically changing usage context while maximizing the Quality of Experience (QoE) - the difficult part. That's why we at bitmovin thought to setup a grand challenge at IEEE ICME 2016 in Seattle, USA with the aim to solicit contributions addressing end-to-end delivery aspects which improve the QoE while optimally utilising the available network infrastructures and its associated costs. This includes the content preparation for DASH, the content delivery within existing networks, and the client implementations. Please feel free to contribute to this exciting problem and if you have further questions or comments, please contact us here.